We took a trip up to the Adirondack Park, we went back into "Nicks Lake", a small lake, part of New York States Park System, no boats with motors allowed, we wandered around the woods and enjoyed our day trip!!. We went into the Trail after signing the book with our names and date and time for our protection incase we got lost, fell, got hurt and did not come out later. The trail is carved out around the lake into the hills and sides, i was able to use small trees and sticks for support. Anna Mae scurried around like a rabbit leaving me behind. I managed to walk out a ways on this down tree but I do not have very good balance yet so this is as far as I wanted to walk out on it!! This is my Honey standing in front of the inlet to Nicks Lake. We are on our way out of the trail going back to the Trail Head. This old huge tree tipped over, I am standing in side this looking out. This is another inlet into the lake, we saw a lot of fish but could not get a good picture of them. Anna Mae coming thru a blow down near the shore line. Great Day, met a couple of old Veterans on the trail sitting around fishing. Talked with them a minute but could not get an answer is they caught any fish even when I could see a nice stringer with some nice Lake Trout hanging from it. We got lucky and won a contest at the Physical Therapist Office where I go for Stroke Therapy , me and my Honey had our names drawn for a free overnight Cabin and a day at the "Enchanted Forest" located in Old Forge, New York, a very popular tourist spot. We got to spend the night in Cabin # 21, complete with table, fire pit and picnic table and fire wood. The front porch had a swing we enjoyed after we unpacked to spend the night!! Inside was electric lights, gas heater, table and a Bible!! I got us a nice fire going and we got a chance to sit down and relax at night after dinner. We took a walk thru the woods near our Cabin. Right behind our cabin in the woods was this deer, she was relaxing in the shade laying on the cool moss, the day was hot and humid. We went down town in Old Forge and took in the shops, diners, and stores that are tourist traps. The next day we went to "The Enchanted Forest" and "Water Safari", This is Paul Bunyan at the Entrance to Enchanted Forest Water Fun and Theme Park we won tickets to see. The first thing we did was We rode the Sky Tram which circles the Park and is very high!. There is lots and lots of Water Rides and Slides and tubes and places to lay in the sun! There were all types of people, you name it, we saw it at the Theme Park, I saw more Tatoos in this park then I did in my 8 years in the Navy. Some of these tatoos were beautiful and some were very ugly, some were done by experts and some were from my past experience were done in "Prison" !! .Mrs. Wood sitting on Wood !!!!!!!!! The Queen of Hearts and the Mad Hatter and my Honey!! I am by Alice In Wonderland and the White Rabbit!!!. I took a Break with these 2 old timers!! We came back around by the Water Park!!!! My Cinderella in her pumpkin Coach!! Don't Forget our Veteran's !!!!! Have not posted in a while, working on medications and some new Stroke Therapy. I do look in the mirror and see someone staring back at me,someone bald, a chisled hard lined face, sunken eyes and I think, how did I get here, then I have to remind myself of so many friends and family who did not make it to this age or get to grow old. .The above picture was me getting ready to enter the Rochester Police Department. Look at that head of hair. .I always kept slim and trim, here I am with my great grandfathers Winchester 25-35, killed my first deer with this in 1962. .The above picture was taken was back in the 60's.
. 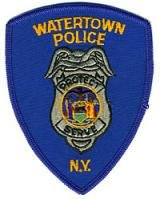 The above photo is me laid up for 8 weeks during the summer, I was trying to make an arrest and the man I wanted to arrest felt he should sucker punch me and knock me down then he jumped on my leg with both feet and broke it just above the ankle, He did go to Jail, for a long, long time!!!!! BUT in the winter it is just one of many bones I broke over the years that ache!!
. 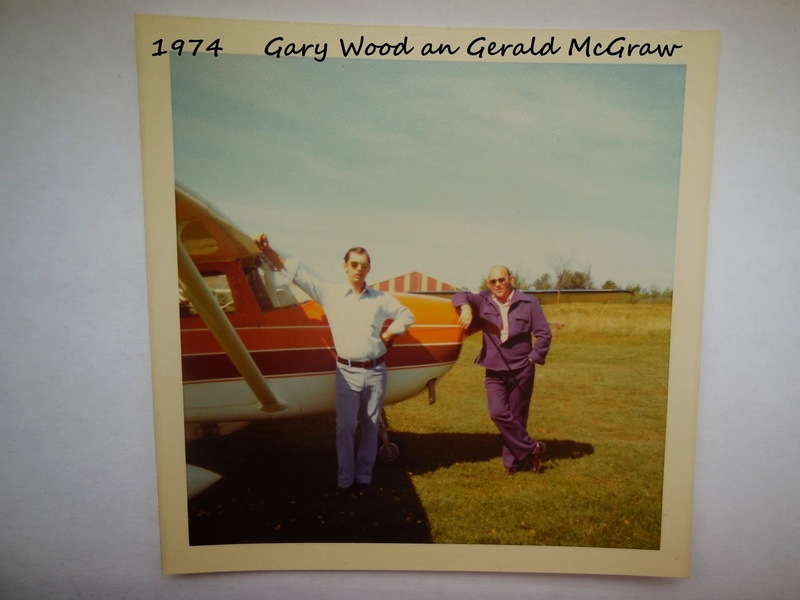 In 1974 I was able to obtain a Pilots License, I used to fly with Sgt McGraw around to different villages . sitting in BaH Habah, Maine eating Lobstah. 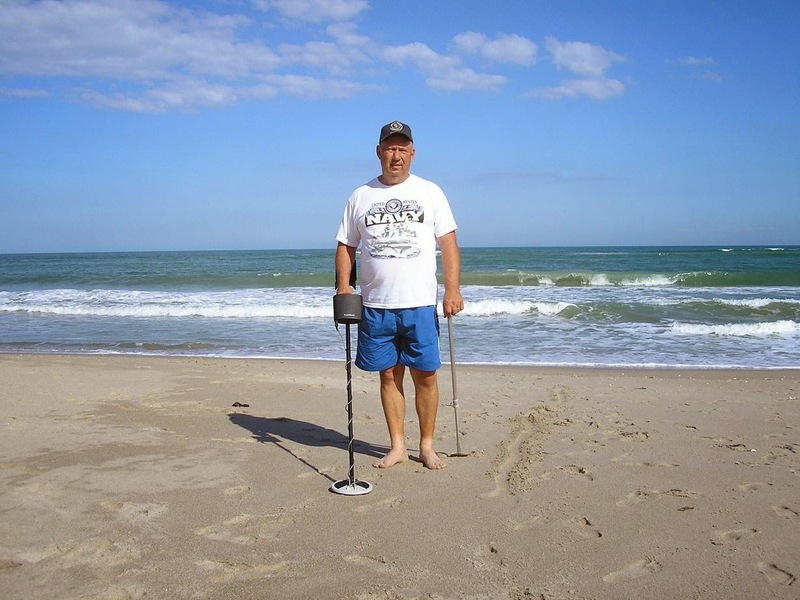 Love the ocean.
. Out on the Beach in the Outer Banks in North Carolina finding my Treasures. 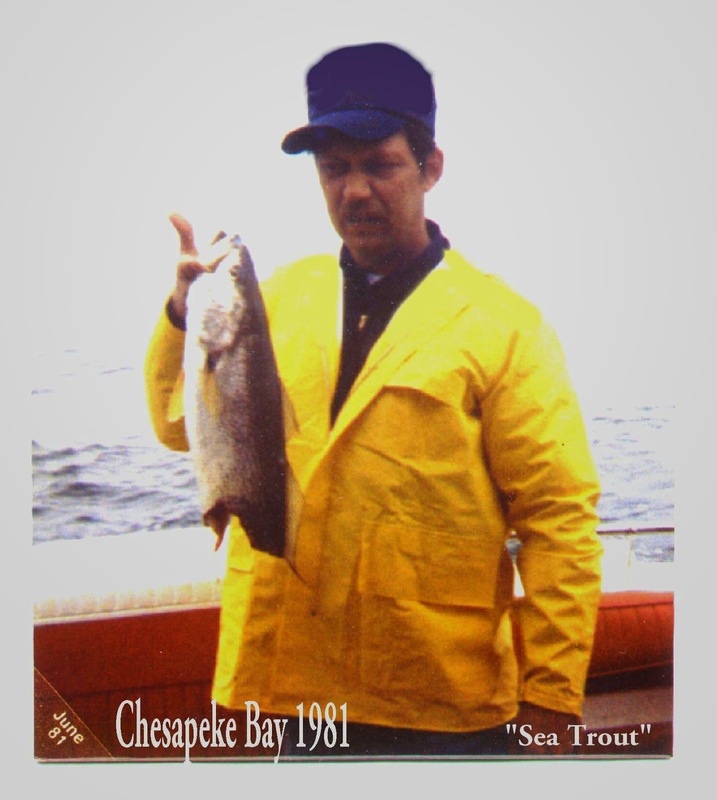 June of 1981 I tried to catch this "Sea Trout", before I could get it into the boat something ate the end of it off, I have several Citations from Virginia for Sea Trout over 16 Pounds. 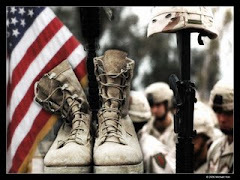 DON'T FORGET, REMEMBER OUR VETS!!!! Physical Therapy is going well, I have had one of my drugs changed, I went from Depakote to Gabbapentin, Depakote works on the brain to calm down the twitching and jerking from the stroke, but does not act as a nerve block, Gabbapentin works as a nerve block allowing more use to the left side. SO, feeling a little better we went camping. We have camped here for 25 years, we have had tents, pop ups, tents and now a Hard-top camper. Most of our Campers were large and we left them set up on Lake Bonaparte up in the Adirondack Mountains. Anna Mae in front of the tree with the "Old Man Face" on it, if you look close you can see the face, this tree has been here as long as we have been here!! All set up, didn't do too bad, hardest part is hooking up and un hlooking camper. These are the leveling braces, very heavy, the stack of lumber is a pain but the 4 bottom pieces are screwed togeather, once unhooked it is not too bad to level, trying to figure something else up to use. I have to find something else as I left them at the campsite and someone picked them up. It is a pain in the a$$ to hook and unhook, the receiver and Ball on the SUV weigh about 80 pounds!!! Camper set up, fridge running, electric OK, fresh cup of 1/2 coffee/1/2 decaf. Lunch with my Honey, grilled cheese and bologna samiches on Pita Pocket Bread. Hot day, Anna Mae cooling her feet in Whetstone Gulf Creek, very cold water. My Honey putting up the night lights. We like the night lights, everyone it seems in the campgrounds have them. Supper was Venison, Potatoes and green beans from the gardem,delicious when you hunt it and kill it and grow it and eat it!! Anna cooling her heels in the creek. I love cooking over an open fire. If Physical Therapy goes well we want to go south on a trial run hauling the camper. My honey making a list of things we need if we tow the camper to Myrtle Beach next month.
. From sunny skys to clouds, thunder and lightning, up here on Tug Hill Storms can get pretty bad, so after a couple days we are cutting the trip short and heading home. I was lucky and found this Poncho I bought in Myrtle Beach a few years back, never wore it till now and it did keep me dry. 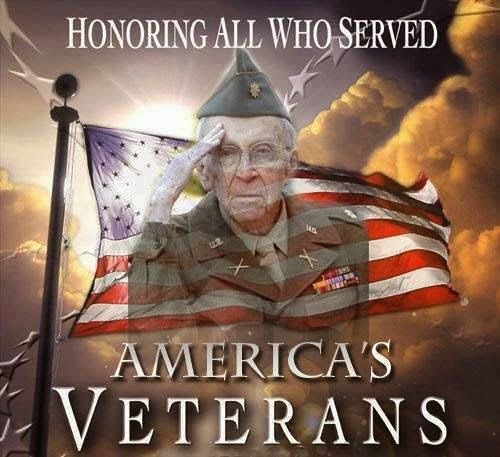 Don't Forget, Remember our Vets!! !.